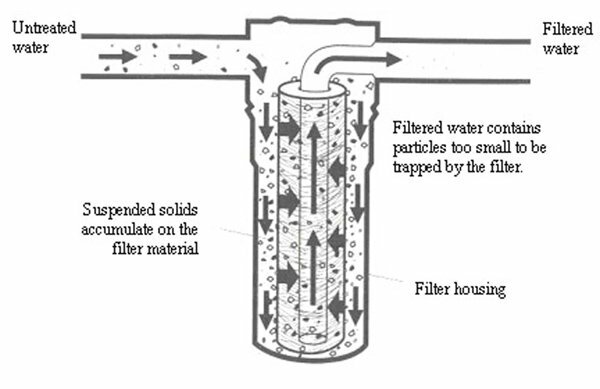 Sediment filters are typically used as a pre-treatment method to help remove debris and particles from water. This will avoid any clogging that might compromise the effectiveness of other, more effective filtration methods, such as carbon adsorption, down the line. These range from simple replacement pleated filters, to filters with self-cleaning backwash capabilities. Activated carbon filters have a porous surface which traps microscopic particles and large organic molecules. The activated surface areas cling to (adsorb) smaller organic molecules. There are two basic types of activated carbon filters: granular and solid block. Granular activated carbon is most commonly used in household drinking water filtration products. These are easy to install and inexpensive. They significantly reduce bad taste and odor caused by gases and chemicals like chlorine and its byproducts, while leaving behind natural minerals that are essential to good health.. Depending on micron size, they may also remove some microorganisms. Solid block carbon filters have a solid honeycombed structure. These are usually whole-house filters, installed directly into the house water supply. They are more expensive than granular activated carbon filters but require less frequent installation, and they reduce more chemicals including pesticides. The most common types of ceramic water filters are pot, cartridge and candle, both of which are typically undersink or countertop. These filters may be treated with silver - a powerful antibiotic - for the reduction of bacteria and many other microorganisms. They may also contain carbon for the reduction of chlorine and other chemicals. The cost of a ceramic filter is low; this, combined with its long filter life and its ability to remove a long list of contaminants makes it advantageous. However, these filters have a much lower flow rate than carbon filters. The simplest form of ceramic filters - the clay pot - has been manufactured for use in developing countries where access to clean water is very limited. Probably the oldest method of water purification, a distiller boils water until it vaporizes. The vapor is carried into a condensation chamber where it cools and liquifies again. Impurities are left behind in the boiling water chamber. There are several major disadvantages to this method of filtration. First, chemicals like chlorine and pesticides which have a boiling point lower than that of water are often carried over with the vapor and can become concentrated in the final product. Second, the process is costly in terms of energy and the amount of water used. Third, the purified water is usually very acidic and absent of natural minerals giving it a flat taste and taking away many of the healthy essentials found in mineral water. Therefore, distillation is not the best method of purification for municipally treated drinking water. In UV filtration, ultraviolet radiation is used to inactivate microorganisms, thereby sanitizing water. However, this method will not remove particles or chemicals and must often be combined with other methods of filtration. Osmosis is the diffusion of water across a semi-permeable membrane from an area of lower solute concentration to an area of higher solute concentraion. Reverse osmosis, as the name implies, is the reverse of this process. Water is forced from an area of higher concentration across a membrane which traps most unwanted water contaminants. This method of purification is highly effective, significantly reducing most particles, chemicals and microorganisms, but it uses a lot of water, and RO filter systems are more expensive than other types. They may be installed under a kitchen sink or fitted to a home's main water pipe. In the ion-exchange process, water travels across a bead-like spherical resin material containing ions which are exchanged with the ions in the water. The ion exchange method is typically used as a pre-treatment method to soften or deionize water. Because it does not remove particles or microorganisms, it should be followed by another method of filtration like carbon adsorption or reverse osmosis.